Judge Martin attended St. Cloud State in Minnesota for two years prior to graduating from the University of Minnesota in 1976. After graduation he traveled around the world before attending law school. He worked days and attended William Mitchell College of Law at night and graduated in 1982. He worked as an investigator for the St. Paul City Attorney's Office before moving to Colorado Springs in 1983. Judge Martin was admitted to the Colorado Bar in 1984. Prior to his appointment to the El Paso County Court, he worked in the Colorado Springs legal clinic and he was in private practice specializing in DUI, traffic, and domestic cases. In 1990 he was appointed Magistrate for Division X in the Fourth Judicial District and his judicial assignments involved domestic and divorce cases. 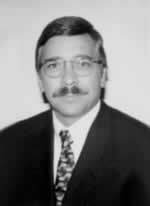 On August 13, 1996, he was appointed to the County Bench and on March 1, 1998, was appointed by Chief Judge Martinez as Presiding County Court Judge. Since his appointment in 1996, Judge Martin has presided over civil, traffic, and misdemeanor cases.